Kelly Macdonald is exquisite, bringing a lovely freshness and authentic life to a familiar sort of character. Even a script that is often improbable and strained cannot detract from her journey, hard as it tries to. The opening scene of Puzzle is a hushed horror, I don’t think it’s too extreme to call it, of domestic servility. Housewife and stay-at-home mom Agnes is so busy hosting a party at her suburban New York home that she cannot participate, much less enjoy it… unlike her husband, Louie (David Denman: Logan Lucky, 13 Hours: The Secret Soldiers of Benghazi), who is having a ball and doing not one single damn thing to help. The kicker of the scene is sadly perfect, a plaintive moment of resigned acceptance on Agnes’s face as she acknowledges to herself, for what we may take as the zillionth time, that this is what her life is now and will forever be: small, lonely, and taken for granted. 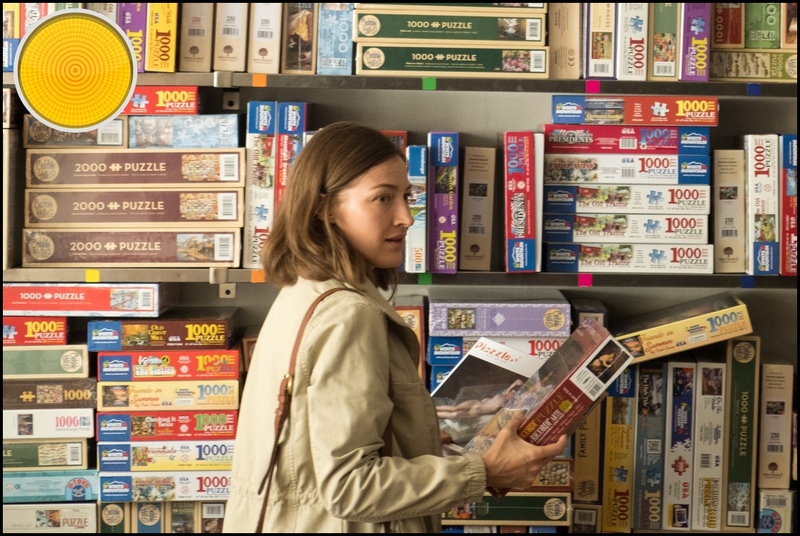 Kelly Macdonald (T2 Trainspotting, Swallows and Amazons) — who, astonishingly, has not headlined a movie before this one — is exquisite in this moment, and throughout Puzzle. Even given that stories about women’s personal journeys remain woefully untold, the “unappreciated housewife” character is a fairly familiar one… but she brings a lovely freshness and authentic life to Agnes. She makes the most of tiny gestures and minute glances to convey the worlds of emotion that Agnes finds in small triumphs as she begins to expand her horizons. This movie works as well as it does solely because of her. Strategy is actually involved in competitive jigsaw puzzling, and it involves — among other things — standing up to puzzle. 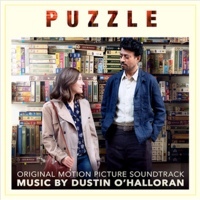 The issues that drag Puzzle down into territory unlikely and then strained are not, in fact, the ones that draw Agnes into the field of competitive jigsaw-puzzle putting-together; this is, you will be unsurprised to hear, a real thing. It’s the oddly old-fashioned world in which Agnes exists that doesn’t quite ring true, the one in which she has to make a special trip into Manhattan to a shop dedicated to jigsaw puzzles to fuel her newly discovered habit (instead of, you know, just popping into her local Target or Walmart), the one in which she is so cloistered and naive that that journey into the Big City trips her up in multiple ways. (This is far from the only example of her improbable innocence.) The out-of-time aspect of Agnes and her life actually serves as a distraction to her story, and a detraction from it: it’s not as if women like Agnes no longer exist, as the film’s neo-1950s vibe would appear to suggest. And it’s not as if men like Louie — who worries about people “using” his wife without realizing that that’s what he’s doing, too — have been relegated to the past. Agnes is a heroine for our time, not whatever retro realm Puzzle thinks it exists in. 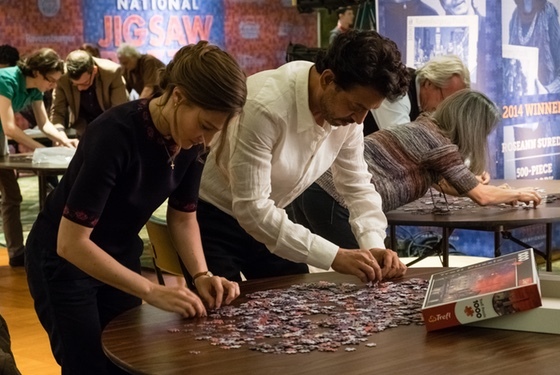 And then, too, there’s the awkward philosophizing of Robert (Irrfan Khan: Inferno, Jurassic World), Agnes’s new puzzle partner, on the rewards of doing jigsaws. It feels tacked on, and wholly unnecessary. Better if their weird hobby had simply gone unexplained. It doesn’t need to be unjustified. Still, the peculiar discomforts of the script — by Oren Moverman (Love & Mercy, The Quiet Ones) and Polly Mann, based on Natalia Smirnoff’s 2010 Argentinian film Rompecabezas — cannot diminish the absolute joy of Macdonald’s performance. The gentle steeliness of Agnes as, for the first time in her life, she insists on having one small aspect of her existence that is hers and hers alone, makes for a deeply poignant portrait. Agnes may be a woman with small ambitions, but she is done sacrificing everything for others. In ways that Agnes would deny, she is a heroine very much for our time, not whatever retro realm Puzzle thinks it exists in. 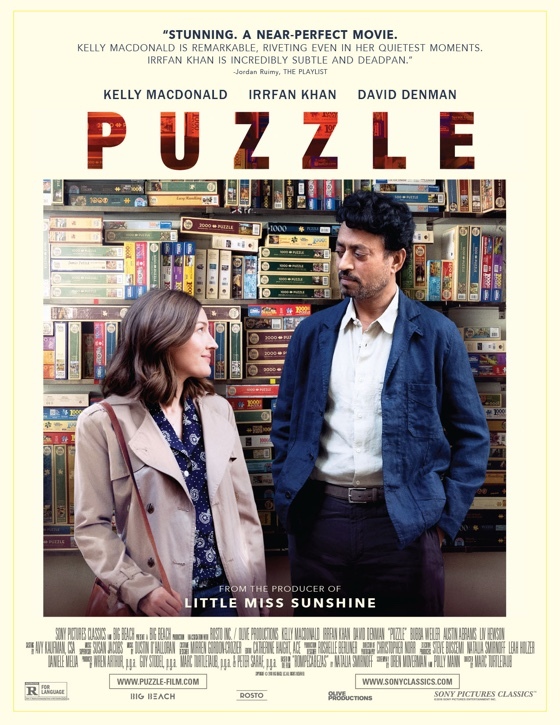 Puzzle is the Alliance of Women Film Journalists’ Movie of the Week for July 27th. Read the comments from AWFJ members — including me — on why the film deserves this honor.